I had the rare privilege recently to work with a team of amazing individuals to help design the Raptor Hand by e-NABLE. This is the latest model of 3D printable prosthetic hands. The 3D modeling work was done by Ivan Owen, Peter Binkley, Frankie Flood, and Andreas Bastian I provided project management and coordination, as well as 3D printing and testing of design iterations. These guys are my heroes! I’ve been doing project management for over 20 years, but I’ve never witnessed a team work so effectively and efficiently as what I witnessed with this team. They started with a blank slate, designed original 3D models for all the parts of the Raptor Hand, including many iterations and improvements – and all within a period of less than one month, on top of working their full-time jobs! The Raptor Hand by e-NABLE was introduced at the recent Prosthetists Meet Printers conference with Johns Hopkins. Please check out Jen Owen’s terrific blog post describing that event. I can’t possibly describe it any better than she did. The design this team came up with is truly elegant. A lot of thought was given to what worked best with previous designs, and where there were issues that could be improved upon. The Raptor Hand is intended to bring together the best and most widely tested ideas from a year of crowdsourced innovation. e-NABLE’s prior “go to” designs included the Cyborg Beast, the Talon hand, the Ody hand, and the Talon Beast. All of the parts needed for assembly can be found easily in most areas. 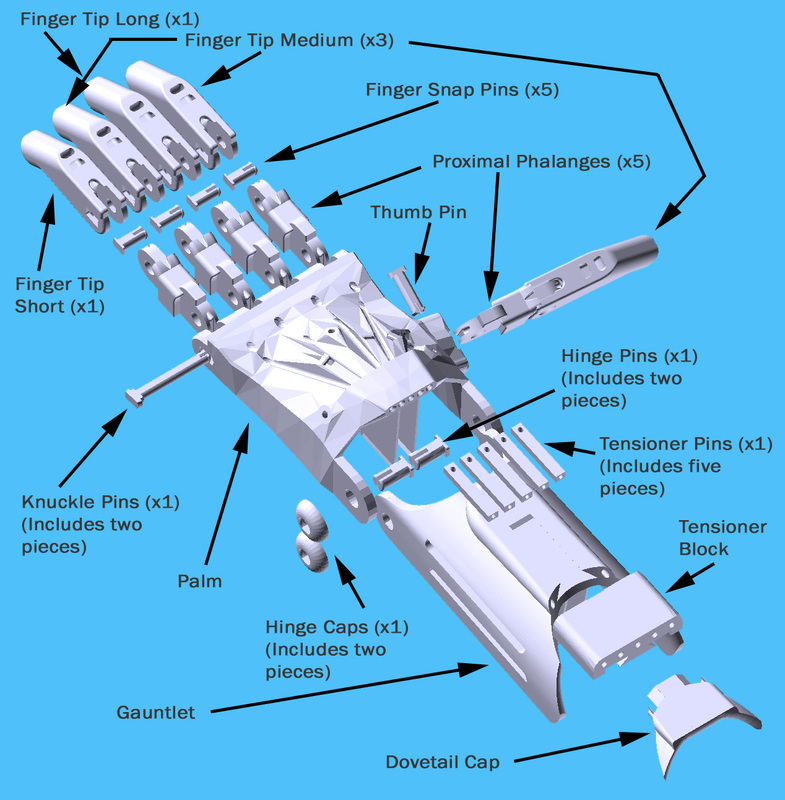 If you prefer to get everything in one place, 3D Universe offers assembly materials kits with all the parts needed for producing a Raptor Hand. The Raptor Hand instruction manual is in the process of being developed. Until then, please refer to the following video tutorial for assembly instructions. If you have a 3D printer with a large enough build plate, you can print all of the parts for an entire Raptor Hand in one pass. Here’s a time-lapse showing the Raptor being printed in various colors. Learn more about getting started with e-NABLE HERE. Learn about e-NABLE Web Central HERE.